Go ahead… have a laugh. I sure did! I helped my sister clean out her garage last weekend (actually, Chris did all the work, I just enjoyed digging through all her stuff) and we came up with some funny pictures of ourselves as children. Since I love you guys so much, I thought I’d give you a glimpse into my earlier years. 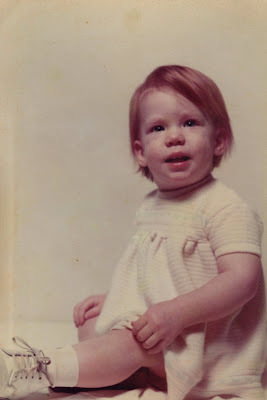 The baby picture, well, what can I say. 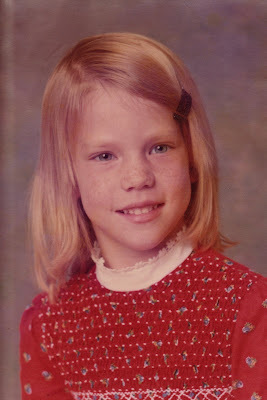 Check out that red hair… good thing my mama loved me. The other picture was taken when I was 7. Not too bad. Guess I was doing my own hair at the ripe old age of 7. Love the little freckles on my nose, reminds me of my Asher. LOVE these pics Stef. You were darling then just as you are beautiful now! SOOOOOOO SWEET!!!! LOVE these photos!! A cute, adorable child grown to be a beautiful & strong woman! What sweet pictures of you Stefanie. Thanks for sharing. Fun, fun. 🙂 I love old photos… well, maybe the OLD old ones. 🙂 My mom & dad dug out home movies the other day when we were at their house. The bad thing was, they were from when I was FIFTEEN! I was mortified. Omigosh! I would have recognized that 7 year old anywhere! You were lovely then too! What a cutie you were (are!)! So adorable! I can definitely see a lot of you in your boys. Love it! Why would we laugh at such cuteness??? What do you mean by “Good thing my mama loved me”? Natural redheads are a rarity… you should be proud to be one. I know that I am! oh girl! what i’ve given for some strawberry red hair! so jealous! isn’t it just like us (girls) to never appreciate how beautifully & perfectly our Creator made us? in our home we have a rule: nobody (including visitors) are allowed to criticize what God has deemed good. i hope you (& your clan) can see glimpses of his goodness every time you look in the mirror.